Pizza lined our bellies. 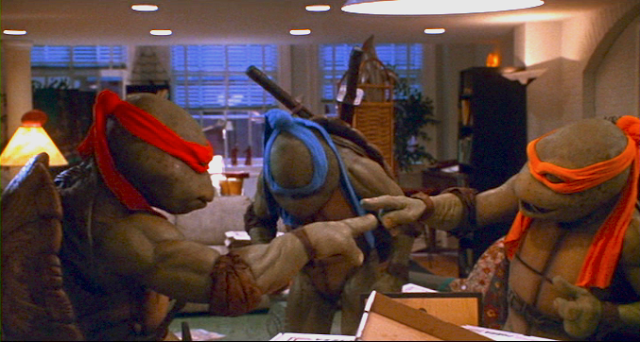 We were riding a 90s, nostalgia high from just watching TMNT 2: Secret of the Ooze. 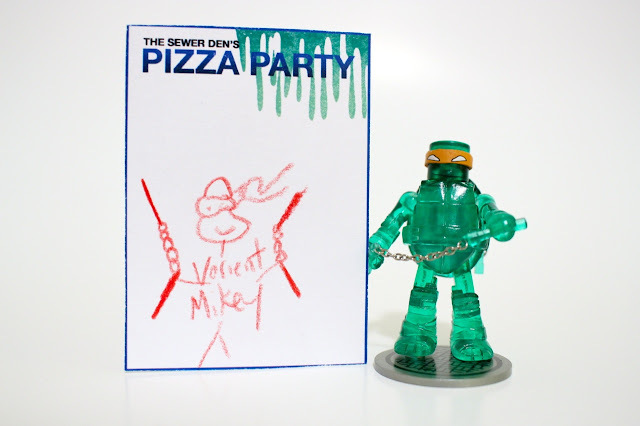 Everything was going perfect at The Sewer Den's Pizza Party. The crowd of 6 was relaxed and well-fed. Our next event would get us moving and put our artistic talents to the test. We broke into teams of two. Each pair would have their own moment in the hotspot, while the rest of the group watched on. Uncomfortable and awesome. As if exposing people's artistic skills weren't pressure enough, there's also a timer - a 7-minute video that included every version of the TMNT theme song from 1987 until now. Every time one song would end and another began, players would reverse their roles. This forced both team members to draw during their turn. Teams would try to draw as many figures as possible during this 7 minutes. 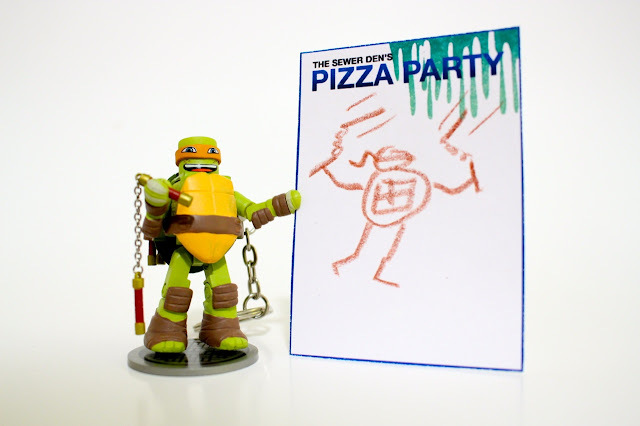 When the timer ran out and all TMNT theme songs were played, players put down their pencils & figures. 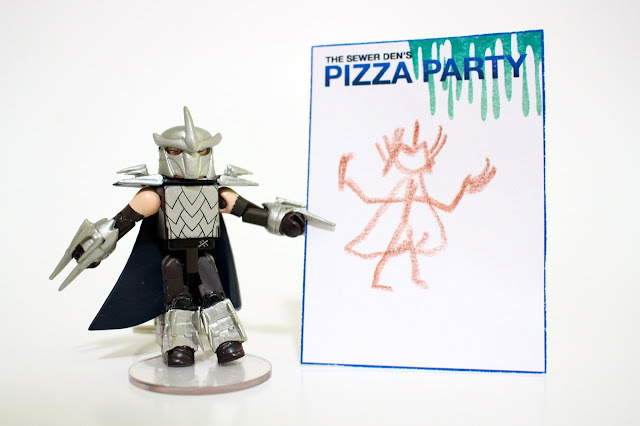 The team with the most properly drawn figures would win. Phew. Are you exhausted from those rules? I hope you saved some energy to read the rest of this! Round 1 paired The Sewer Den & Sommerjam (Jon, a.k.a. ME & Jeff) together. 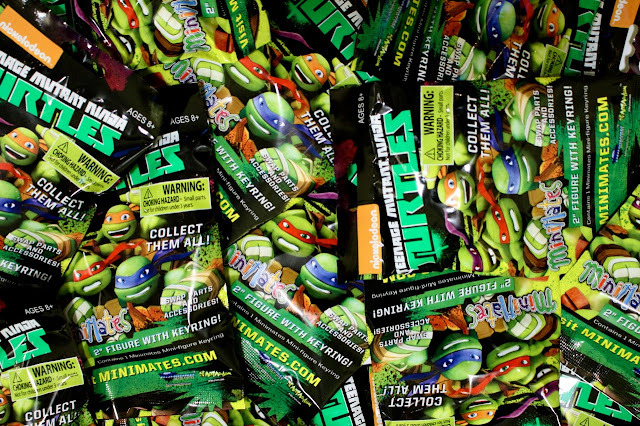 Our team would be opening blind bags from Diamond Select Toys TMNT Minimates Series 1. 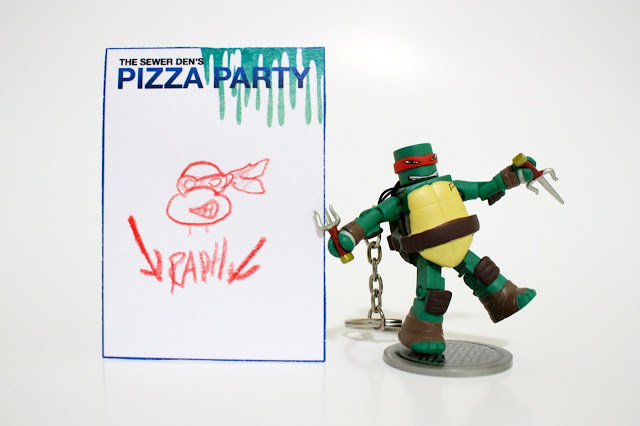 Let's see what 7-minutes of Turtle sketches & Minimates boils down to. Works of art or hot trash? Cue the music, Anddddddd GO! The leader in blue kicked things off. His swords look great both sketched and in plastic. The hot-headed hero gets a sketch that does him no justice. 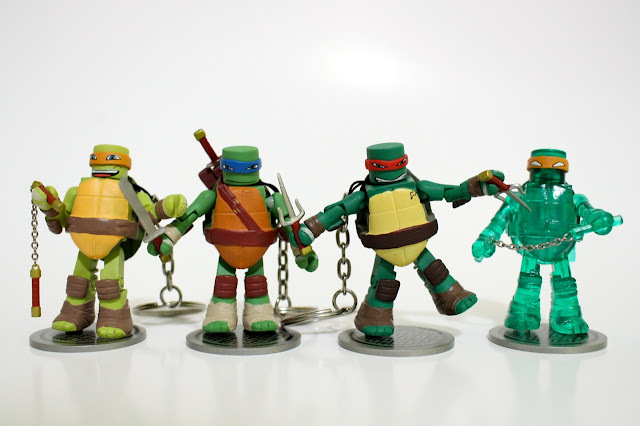 Party-loving Mikey and his real-chained accessories. When this dude was described to me, I was guessing he was a variant of some sort. Little did I know he'd be translucent green (and that I spelled variant wrong). 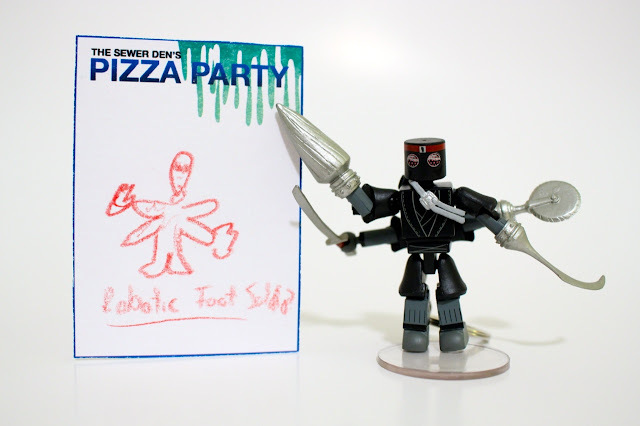 The leader of the Foot Clan crashed our party! Knowing the Nickelodeon TMNT series quite well, I knew which character Jeff had opened when he described the figure as "4-armed & pajama-wearing." One of the brainy baddies gets the Minimate treatment. 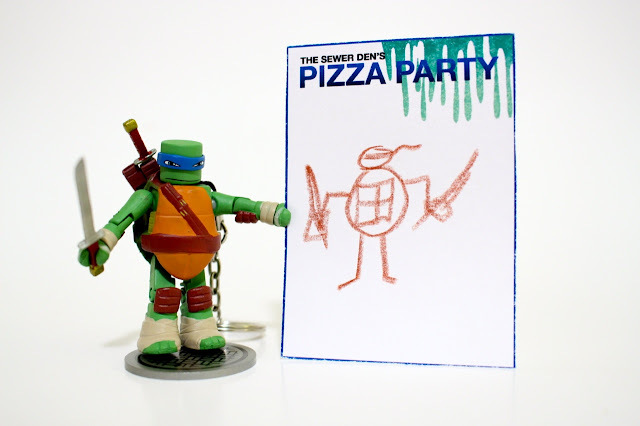 The 7-minute marathon of TMNT themes ended and Round 1 of Sewer Sketch was finished. It was a beautiful disaster of wonky artwork and a fury of blind bag opening. Our team successfully sketched 7 Minimates. I'll let you be judge in regards to their artistic merit. As for the toys themselves, I was surprisingly impressed with their design. Each figure was unique and included a batch of quality accessories, a stand for displaying, a removable keychain & a decent amount of articulation. Our team opened a solid group of heroes, with each Turtle having their own set of distinct features. The batch of villains we revealed are equally as impressive. 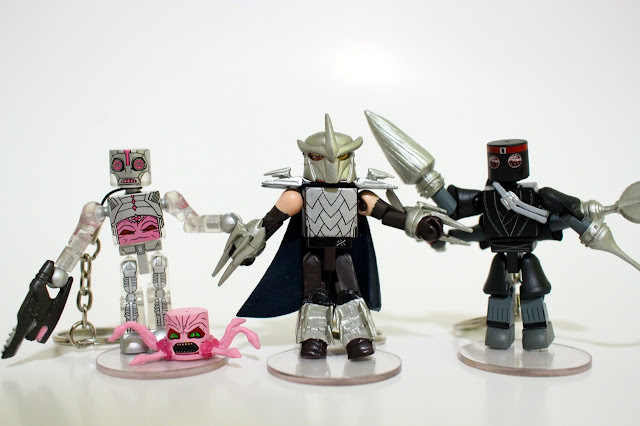 The Kraang figure, along with his pink companion, are my favorite. They just look so fun! Although their design is kind of blocky, it captures the spirit of the cartoon much more than the Kraang figure from Playmates. That's not a diss on that line, but rather a big complement to the Minimates figures Diamond Select Toys has released. They've really nailed the heart & soul of the show in these tiny pieces of plastic, 4-armed, pajama-wearing and all. One villain, one hero - our team missed out on 2 figures. Again, these two have solid designs that embrace their cartoon counterparts. Donatello is especially adorable with the gap between his teeth. The pose I placed him in is also 100% amazing. He looks so darn happy. Round 1 of Sewer Sketch was in the books. It was a whirlwind of doodling. The party goers now knew Jeff's artistic abilities and my limitations. Would the other teams sketch more than 7 figures? Would their drawings be better or worse? 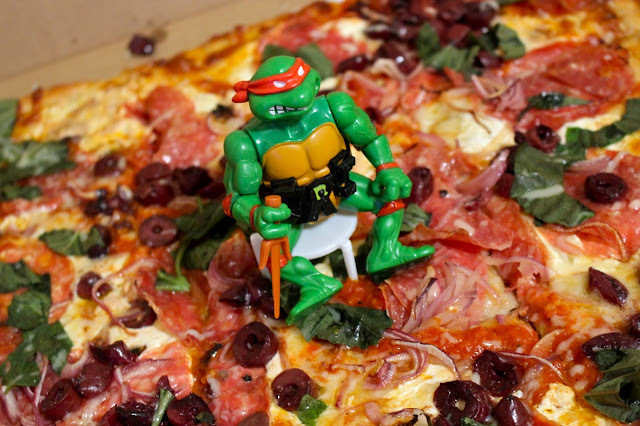 Check back tomorrow for PART 4 of The Sewer Den's Pizza Party. 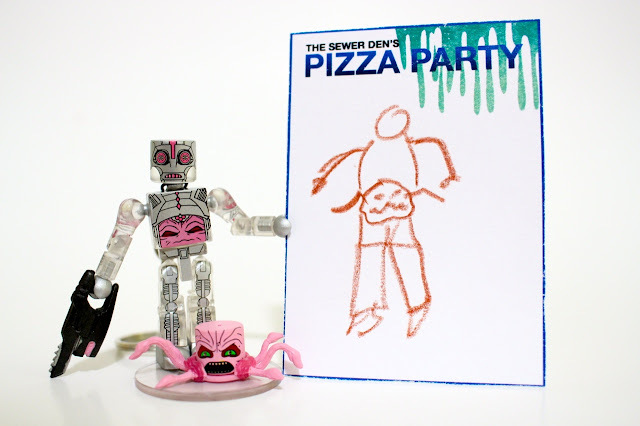 We'll kick off Round 2 of Sewer Sketch with more merchandise, toys & questionable artwork. The mutant mayhem continues! That's actually a damn good idea for a game. 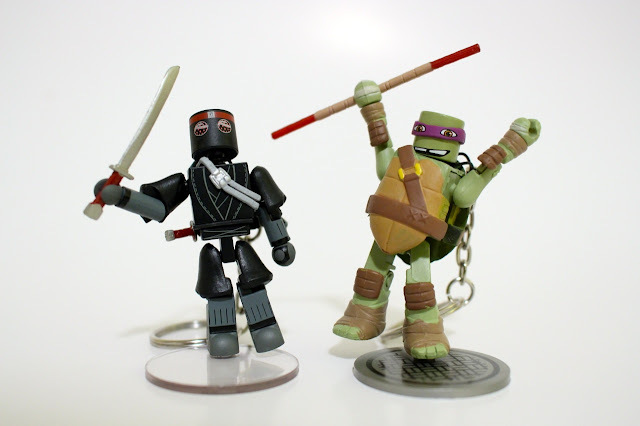 I'm usually not a fan of the Minimates line, but those are some great looking figures. Err..keychains. I like that the keychains come off. Sometimes I wanna play with my toys without my house keys!